Back in the days before our homes had several entertainment screens in them, the only way to get some screen entertainment was to go the picture theatre – or cinema, as we now know it. In the Bondi area alone (including Bondi Junction), there were at least half a dozen picture theatres in operation around the 1920s, 1930s. 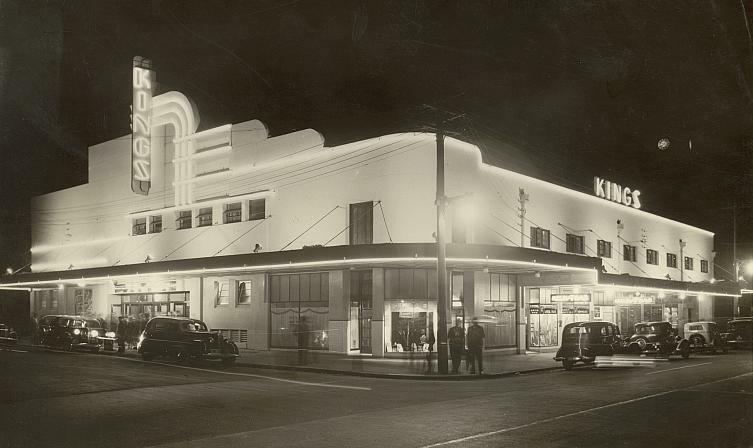 There were also picture theatres in neighbouring suburbs like Rose Bay and Randwick. When the Wintergarden Theatre in Rose Bay went into the hands of developers I remember feeling quite disappointed at the defeat that locals faced regarding the planned demolition of the theatre. The bulldozers came in 1987. Down went the Wintergarden and up came apartments. There was a cinema on the corner of Hall St, O’Brien St and Glenayr Avenue and there was also the Kings Cinema at Bondi Beach, corner of Roscoe St (where I once lived) and Campbell Parade. This image of the Kings Cinema, is reproduced here with kind permission of The Mitchell Library, State Library NSW. By 1970, most of these cinemas had closed, though there were still two or three operating in Bondi Junction. I’m not sure why the cinemas closed but I suspect it may have had something to do with the advent of television and perhaps offers from developers which,at the time, were maybe too reasonable to refuse. I can remember going to see Mary Poppins in the Metro cinema in Bondi Junction as a very young child and as a young adolescent, I remember seeing a couple of flicks at the Star Cinema, also in Bondi Junction which closed in the mid-late 1970s. I do remember the building which was formerly the King’s Cinema at Bondi Beach but by the time I was a young girl, this cinema was no longer in operation. However at one point in the late 1970s it was used to house The Creole Disco. Of course this site (and gorgeous art deco building) was bulldozed in the ealry 1980s to make way for what else – an apartment block known as The Breakers! Of course today Bondi has the wonderful Westfield mulitplex, pulp cinema, to replace the old picture theatres which clearly were a “waste of space” in some people’s eyes, or prime real estate that could be capitlised upon. So now, when we want an out of home community-based screen experience, the only cinema that Bondi has to offer (apart from the seasonal outdoor film events) is the mulitplex (Event) cinema in Bondi Junction – convenient for the “drive, park and eat” lifestyle which characterises so many of our lives today. And when we get that parking spot, chow down on some food from the food hall and then collect the tickets that we’d pre-booked online, we go and lap up a flick in a cinema without character, and without cultural history. Does anyone remember going to any of the old picture theatres in the Bondi area? or does anyone have a story to tell about any of the old cinemas? or perhaps have any photos of these now long gone buildings? I remember the Wintergarden vividly, with the fantastic fountain in the tea room and super Saturday afternoon double features. It was a sad day when it fell into the hands of developers. And now the Academy Twin (although not exactly a picture palace, or in Bondi) has been assigned to oblivion despite the best efforts of Palace cinemas to negotiate a deal with their landlords. I guess all things must change but it is sad that so many old buildings around an iconic suburb like Bondi are being demolished rather than restored. Yes of course some buildings must get demolished but sometimes keeping some of the old architecture and restoring the old helps keep a sense of history about a place rather than re-inventing a place to suit consumption and tourism. I remember 3 cinemas at Bondi – growing up there as I did from 1959 – 1974. They were the Metro, The Coronet & the Star. The Metro seemed to have all the Disney Films and I can’t count the number of times I saw the Love Bug thereat the Saturday Matinee. The Coronet showed more ‘adult’ films – I remember being taken to see Lawrence of Arabia there – and falling asleep. The Star was a bit of a mix. The Metro went when they bulldozed the Church opposite Grace Brothers to make way for the Bondi Shopping plaza. From Memory the Metro was next to the Bondi Junction Hotel, which survived (in some form) but the theatre and the church were lost. I think the Coronet went soon after. I think the Star was the last to go. We would also go to the Wintergarden in Rose Bay and I think the Paris at the top of Oxford Street opposite Hyde Park, where The sound of Music played for about 7 years. Couldn’t find any pictures of the exterior of any, sadly. There are some photos of the interior of the Regal (which I now know from Barry’s post) was the metro, on the NSW archives site. Hi Jenny, great to hear your memories of going to the cinemas in Bondi. I also remember going to the Metro and seeing the Disney films…like you I remember seeing The Love Bug in that cinema and I think The Million Dollar Duck. Yes, the Star was the last to go in the Junction. And I think I also remeber the Paris. I remember seeing a few films in the cinema opposite Hyde Park almost where Oxford meets Elizabeth St, not sure if that was the Paris? but I think it might have been. Thanks for joining in on the banter! Yes, it was the Paris Cinema…funny little place it was. No one has mentioned the Woollahra, a Hoyts Cinema (I think) opposite Centennial Park. I’ll forgive you for not knowing of Audie Murphy for the unexpected memories of these pages. You mention that the Metro tended to screen the Disney movies. The very first movie I ever saw at a cinema was Disney’s The Jungle Book, and that would have been 1967 or 68 (in which I turned 6 and 7 respectively). One of my memories of this was everyone standing for the national anthem of the time, Good Save the Queen, before the movie commenced. I think this ritual died not long after that. I also remember my first visit to the Star theatre, when we went to see Chitty Chitty Bang Bang in 1969. Amazing that the council is all for keeping heritage listed buildings, yet allow for the Kings cinema to be bulldozed to make way for yet another Bondi residential pad (The Breakers). We are becoming very Amercianised, in that little unique Suburbs that once housed local cinemas, are being pushed aside for large shopping malls, housing super duper cinemas. No wonder the sense of community spirit is slowly dwindling. I remember days paddling in the bay out the back of the old Wintergarden! I actually even remember them screening Rosemary’s Baby. The last time I was in the area was 2004. The whole provincial feel that was once the aura of Rose Bay to Watson’s Bay, Bondi to the Junction had already changed to something else. Yes unfortunately you would see so many more changes in Bondi since you were last here – the changes I’ve seen in less than a year are incredible! I grew up in Bondi in the 1940′s/50′s and so the picture theatre (or cinema!) scene was part of my culture. The Kings Theatre had a wonderful “smell” – a form of air freshener I suppose – and the interior art decor lighting gave it a cosy feel. There was no raked seating in the stalls (budget conversion from a skating rink I believe) and they had matinees Mon – Sat ; Hoyts SIx Ways had the “CCC” The Childrens’ Cinema Club on Saturday mornings until the late 40′s. It was replaced by a childrens’ matinee with three serials, cartoons and a main movie. tHe trick there was to roll Jaffas (do they still make those?) from the back of the stalls to the front row. I remember the Bondi Junction Metro when it was the Regal. Also went often to the Coronet just opposite – and the Star in Bronte Road. All part of growing up. All good fun. Thanks for sharing your memories Barry, and for describing what the picture theatre scene was like in Bondi when you were growing up. Sounds like very fun times! I love these kinds of stories and memories, so please people, keep them coming! My first movie at the “pitchers” was 101 Dalmations,@ Metro BJ. My little brother got bored and asked Mum to “change the channel “!!!! My aunt took me to see James Bond “ThunderBall” at The Star don’t remember the year. I think I was her beard,’cos she fancied Sean Connery. Nice memories and funny stories about going to the “pitchers” Cassandra! I believe my first movie was Mary Poppins, also at The Metro BJ. Thanks for visiting Bondi Banter and for contributing to the banter! My mother worked at the Kings in Roscoe Street for many years both before and after I was born. When I was only young I would often have to watch the same movie several times while mum worked. Saw “Born Free” about 15 times. Mum actually worked the last ever showing there. That’s a lovely Bondi memory Paula! How special that your mum worked at the Kings at Bondi. 15 times watching the same flick is pretty good going! I was assistant projectionist at the Coronet Theatre, Bondi Junction in the 1950′s. When the Queen came to visit I had to paint the front pinlights red (white) and blue using a long stick attached to a tin of paint, in which I dipped each light to be coloured. I love this story Warren. Thanks for sharing. I love these kinds of memories which say a lot about the social mores of the time. It wasn’t all that long ago, but how things have changed! Thanks for your nice comments. Indeed, it was another world. We projectionists used to go for coffee to the Arabian Coffee Lounge of Harry and Pixie’s Moulin Rouge at Kings Cross after the pictures. I’m married and in another world, now, but it’s nice to look back. As a Coronet assistant projectionist, after the show we used to go to the Cross for coffee at the Moulin Rouge or Arabian Coffee Lounge or sometimes Harry’s Cafe de Wheels. Stan Fitzallen was the manager of the Coronet. Dear Keith One night, we were running “Knights of the Round Table”, I think, in cinemascope and the film broke near the end so, to not have a blank screen, I quickly put “God save the Queen” in normal picture ratio on the screen, but in the panic forgot to change the cinemasccope lens back to the normal ration lens. Thus, we accidentally showed the Queen 6 feet high on a horse 40 feet long in cinemascope. This resulted in a letter from head office that if this ever happened again, to turn off the light and just play the sound of “God save the Queen.” You only get seconds when a film breaks. I too saw my first film at Metro BJ. That’s when I must have fallen in love with Julie Andrews. I then worked at the Wintergarden in Rose Bay as a ticket collector and played the piano in the mezzanine during the interval. I think I was about 10 years old. After that I worked at the Village Twin Cinema in Double for many years which is now sadly, derelict. In all I worked for over 20 years in the industry and have many fond memories. Hi Gary, I must have encountered you at the Village Cinema in Double Bay! I saw so many films there. Whenever I drive past these days and see it in the derelict state that it’s in, I feel saddened. What shame it closed down. I think many Double Bay businesses feel the same. That is very cool that you played the piano at The Wintergarden at age 10! Thanks for visiting the blog and for joining the banter. I’m sure I’d recognise many faces from the Village days. By the way, I hear that there’s a proposal of a new 5-screen cinema for Double Bay at the site of the old Carlton Ritz. Keeping all fingers crossed! Yes Gary, the proposals for that old Carlton Ritz site has been getting a bit of press in the Wentworth Courier and yes, a cinema seems to be part of the deal. It seems like many people in the community want a cinema to return the area. But what would be a shame is if the cinema only screened the usual mainstream fare and didn’t show the more art-house or independent films that the old Village used to show. For me, that was one of the best things about the Village, it screened the more art-house and independent films rather than the blockbusters and mainstream films. Sill vivid memory from the Saturday afternoon matinee at Hoyts Six Ways: the Hopalong Cassidy serial ending (say) with his burning wagon — him in it — plunging over the cliff towards certain death and next’s week’s episode opening with him leaping to safety before it goes over. Boooo. No wonder stink bombs got let off regularly, causing gleeful evacuation of all us kids. He-he! That is a fantastic memory John! I wasn’t aware that stink bombs were let off in the cinemas. Fun times, fun days. I wish the cinema at Six Ways was still operating today…with cheeky kids in there! Thanks for joining in the Bondi Banter. G’day, Had a good laugh when we had a little get together about the Flying Pie man. and how he got busted with cans of PAL LOL, I had eaten enough pies from there, bloody noyce too, and I reckon that is why I could run like a whippet. I wander HOW many would admit that they really did like the pies, I loved em, and how many would admit that they ate em. LOL Loved 60′ & 70′s Bondi.can’t stand the sleeze bags that get down there now.Glad to have had it at the good times. Still a few old faces about, but not many.great blog too . Onyas. I too remember the story about the Flying Pieman getting busted with cans of PAL, but was never sure if it was a Bondi tall story or truth. I don’t recall eating his pies, but I vividly remember my friends & I buying his cream buns and other sweet things – sometimes in the very early hours of the morning after a big night out! Bondi in the 1960s and 1970s was definitely a different suburb to Bondi these days. I’m having a trip back into my childhood growing up in Bondi! Have just been to see the Block houses and walked down to Campbell Pde to see my first school, Bondi Beach public School where I was enrolled in 1944. My memory of Kings Cinema was when we used to have our school’s Empire Day concert there!. We, who were not performing, were marched holding hands, crocodile fashion along Campbell Pde to the Kings to enjoy celebrating Empire Day on the 24th May each year. My 2 aunties who lived in Blair St had a permanent booking Saturday nights, at the Six Ways pictures and often took me if it was school holidays. What a treat that was. I remember falling in love with Audie Murphy when I was 7 yrs old! It sounds like you no longer live in the Bondi area? I loved reading about your memories going to the Kings Cinema and celebrating Empire Day. I know from my professional research work that Empire Day was really quote a big deal when we still celebrated it. I just did a search on Audie Murphy – have to confess I hadn’t heard of him before. Thank you for taking the time to share your memories and contribute to the banter here. Much appreciated! I have memories of the 6 ways theatre at Hall st., Kings, which was slightly more upper class, and Bondi Road theatre, not so hot! I was at the 6 ways theatre on the night the Japanese shelled Sydney. My cousin and I could not understand why the lights had gone out and everyone left! We strolled home unaware that there had been sirens warning us. At the corner of Wellington St. and O’Brien st. there was a Wardens post and the men came out and told us to scoot home, which we did and spent the night under the kitchen table. A shell passed over our house and landed in the street behind us, but it was a dud, fortunately. Interesting days, and I loved Bondi so much, that I would move back tomorrow if I could. Our old house is still standing, in Wellington Street. That is an awesome story Pat! and a coincidence I was only just read your comment tonight since I have been doing some research about Japan & Australia in WW2 earlier tonight! Thank you for sharing. Amazing that your old house is still standing – so many have since been bulldozed to become modern “mansions” and the like! I grew up in Bondi in the 50s/60s. I have fond memories of the Kings Picture show in Roscoe St, saw many a movie there. I also worked in the school holidays at the Metro at Bondi Junction and couldn’t tell you how many times I saw Mary Poppins. I no longer live in Bondi, but had a back to Bondi day with my family recently, and was surprised at all the changes that have taken place there. Such a shame. Thank you for dropping by here and sharing your memories. We might have been watching the same screening of Mary Poppins at the Metro! Re your recent visit to Bondi…I am not surprised that you were surprised at all the changes that have taken place in Bondi. Indeed, it is a shame. As for the Rose Bay Wintergarden, the then council who allowed the trash the rights to destroy such a wonderful Picture Palace should be jailed. Then to add insult to injury, build an ugly stone monument for the rich & call it The Wintergarden. The Wintergarden was indeed a beautiful picture palace and such a shocking decision that it was destroyed for the sake of some apartments. It amazes me how decisions like that get made! But that’s how we seem to roll in Sydney! Some of the best memories of my life revolve around Bondi Junction in the late 70′s in perticular buying Six Million Dollar man & STAR WARS toys and Mego figures from Grace Bros plus my Dad used to get his 8 Track cartridges from GB’s too. I remember seeing ABBA the movie at Hoyts in Oxford st in 1978 plus lots of other movies till about 1986 when I was allowed to venture into the city with my friends. I was fortunate enough to see ABBA the movie in the same theatre in January 1999 when they had a ABBA night there and it made me feel 4 years old again. Anyway I miss the old Bondi Junction and I hate what they have done with it and as we all know it will never be the same. Thank you for sharing your memories…your stories made me feel very nostalgic and almost teary for the old Junction. I can assure you, that you are not alone as far as having great memories of Bondi Junction and GBs go. I too spent so much of my childhood and teens in the Junction and GBs was big part of that. And I too remember that little cafe upstairs – I used to get raisin toast there. Waltons was so quaint when I think of it now – very kind of 1960s vibe which carried through into the 70s. I think I got my first training bra from Waltons! Hope you can drop by to this blog again sometime. Has anyone got interior pics from GB’s ??? All I can find online are outside shots on Oxford st but they are from the 50′s and 60′s. I’m looking for 70′s and 80′s. Joshua, I would also love to see some interior pics of GBs from the 1970s and 1980s. I sometimes have flashbacks of areas of the store – knew it intimately! Please let me know if you find any. Thanks. Joshua, that’s a shame that you haven’t come across any interior pics of GBs, but thank you for responding and letting me know. I appreciate it. Re the T-Shirt transfer bar…yes I do remember it. When I find some time I might try and see if I can locate some interior pics of GBs and post them. I used to live in Waverley and remember going regularly to the Saturday matinees at Hoyts Bondi Road. It was very much in the Art Deco style. There was usually a cowboy film plus three serials and a couple of cartoons. I remember one day the equipment broke down and the theatre manager got on stage and led us all in a singalong until the problem was fixed! One film I remember seeing was ” The Big Sky”..an early Kirk Douglas film. The year was about 1953. Thanks for sharing your memories here Terry. That’s a great story about the singalong! Something that would never happen today (well not in one of the multiplex cinemas anyway) given that there are no longer projectionists working in cinemas! 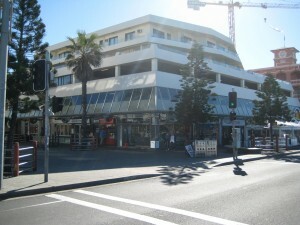 There is a petrol station now standing where the Hoyts Bondi Road cinema used to be. I would have loved to have visited that cinema but I think it ceased operating (or maybe even standing) by the time I was born. Can anyone assist me getting in touch with Warren, the former assistant projectionist at the Coronet Cinema, Bondi Junction. I am writing a short story based on a fabulous 50s film The Smallest Show on Earth. The Coronet and the Metro opposite will be the two competing cinemas – though I may rename Metro the Star. I’m sure Warren will have some fabulous stories to tell about the old place. I used to watch the trams rumble by on their way to Bondi. My email is taptoe11@bigpond.com or phone 03 53562493. I now live in Stawell, Victoria. Have tried Keith, but still no luck I’m afraid. If you like this subject you might be interested in this group.. This group tries to record the history of the cinema and theatre building in Australia. Indeed I have been aware of CATHS for some time and have been in touch with CATHS in the past. A great society and archive which I heartily support and endorse! Interesting as I read where it was suggested that the old Bondi Road Hoyts theatre was not as well fitted out as some of the other theatres in the area. This was not my recollection as I grew up nearby in the 1940/1950′s and I do remember the theatre having a special mother’s room which was I think a first in the area, if a baby was crying they could be allowed to sit in a sound proof area at the back of the theatre, it was a place where mothers’ could still see the movie but at the same time let the other patrons see & hear the presentation uninterrupted. From memory it had approx a row of a dozen seats. Yes who knows what was being referred to when it was suggested that the old Bondi Road Hoyts Theatre was not well fitted out, since from what you have described, re the special mother’s room, it sounds amazingly well fitted out, particularly for that era. The things you learn from visitors coming to this blog such as you! Thanks so much for stopping by and sharing this here. Hope you’ll visit again. Growing up in Allens Parade Bondi Junction meant it was a short walk down my street and across the road to the Star Theatre where a few of us would sneak around the back and open a big timber door which was left unlocked as a fire exit, crawl on our hands and knees, crawl under some heavy red velvet curtains and quickly find a seat and watch surfing movies they showed during summer. Great memories. I do miss the Star Theatre. It was so big and glorious to me (when I was a kid anyway). I love the cheeky memory you’ve shared here. Thank you. Gotta love those heavy red velvet curtains! I wish I’d seen surfing movies at The Star, but the two films I recall seeing there now are “1776″ with my friends and “Jonathan Livingston Seagull” – which my dad took me to and I think was probably one of the most (if not the most) boring movie I’d ever seen. Thanks again for dropping in here. The Kings Cinema/Creole nightclub was not bulldozed by the developers, at least not initially. It was burned down by Jimmy Anderson as part of his ongoing vendetta against Abe Saffron. I was at the beach that afternoon, and it’s still the biggest fire I have ever personally witnessed. The flames rose way above the building. Quite audacious of Jimmy to stage an arson attack on Campbell Parade on a sunny weekend afternoon. I do remember that the Creole was burned down. I was a young teen at the time. Not a nice memory to have of Bondi. Lucky no lives were lost. But it sounds like this is what happened to the old King’s Cinema building then. Destroyed by flames rather than developers and as you say, an audacious act indeed! Thanks for adding to the post here. I grew up in Bondi for the first 18 years of my life and recall the theatres mentioned above and the mother’s rooms. Our mum loved the movies and we went whenever we could. I have seen no mentioned of the outdoor films shown at the Bondi Pavilion?? We sat in old timber and canvas deck chairs in an area surrounded by what I recall was potato sacking screening. The films were shown after dusk. I left Bondi in 1964 but I’m sure it was in the 1950s. When I was a teen I remember sitting in the back rows at Six Ways with my “boyfirend” holding hands, kissing and cuddling. My most vivid memory is seeing a scary movie about a black cat that turned into a panther. Walking home to Lucius St on m y own (I was 12 or 13), up the back lane off Lamrock Avenue, a black cat started following me.. when I ran it ran. It’s eyes glowing yellow (just like in the movie) by the time I got home I was hysterical!! We used to love going to the scary movies around that time. Thank you for coming to Bondi Banter and for providing your wonderful contributions here. I apologise for taking so long to have your comments up and approved. I had to leave attending to this blog for a while. But I love the memories that you shared here about going to the movies. I grew up very close to Six Ways, and often think about what it must have been like with the picture theatre there. By the time I was born, that picture and many others in the area were no longer in operation. I was not aware of the outdoor films shown at the Pavilion back then, but again, I have wondered about if this happened many times. I love the fact that there was an open air drive-in cinema there! Noni, thanks again for visiting! Ken Cook’s Pacific Open Air Drive-in Cinema at the Bondi Pavilion Auditorium opened on Friday 12 Oct 1951. Films commenced after dusk. People who did not have a car could watch the films seated in reclining cane chairs. The whole area was enclosed in a hessian screened wall. Anyone could smoke. Mothers took babies in prams which were parked in an area away from the lighting. Bondi Six Ways Theatre (1923 – 1959) – After opening in 1923 and being operated by the Betts family, this cinema was acquired by Hoyts in 1937. Located at the six ways intersection at Bondi, on the corner bounded by Hall St, O’Brien St and partly Glenayr Ave. It screened its last program in 1959 and was later demolished. Published by Waverley Library from sources in the Local History Collection, 2008. Bondi Beach Kings Theatre (1937 – 1969) – Opposite the beach in Campbell Parade, on the corner of Roscoe Street, the Bondi Beach Kings Theatre started life as a dance hall before being converted to a cinema in 1937. It closed in 1969 and became a club and disco.